PM #40762529 $5.00 • Vol. 29, No. 24 July 23, 2018 L AW TIMES C O V E R I N G O N T A R I O ' S L E G A L S C E N E • W W W . L A W T I M E S N E W S . C O M Ruling dismissing libel action to be appealed David Elmaleh says a recent Superior Court ruling reflects the will of the provincial legislature when the anti-SLAPP statute was enacted. Photo: Robin Kuniski AFTER #METOO Rules of professional conduct useful P7 ROLE OF THE OCL Case addresses disclosure obligations P7 FOCUS ON Litigation Funding P8 BY SHANNON KARI For Law Times A prominent class action litigator turned political activist says he intends to appeal a Superior Court ruling that dismissed a libel ac- tion he brought against B'nai Brith Canada after it suggested in an online post that he advocated on behalf of terrorists. The lawsuit that Dimitri Lasca- ris filed against B'nai Brith, seek- ing $200,000 in damages, was thrown out by Justice Helen Rady, who found that the organization met the legal test set out in the pro- vincial anti-SLAPP statute on the basis of fair comment. "The plaintiff 's action must be dismissed, because he is unable to show that the defendant has no valid defence against his claim," stated Rady in her ruling issued June 28. Lascaris says he supports the anti-SLAPP provisions, but he be- lieves it was not applied properly in this litigation. "My case is the exact opposite," says Lascaris. "B'nai Brith has significant fi- nancial resources. After I sued, they did not change their behav- iour. There is no evidence they were chilled," says Lascaris, a for- mer partner at Siskinds LLP and head of its securities class actions group, who left the profession two years ago to focus on activism. He also ran unsuccessfully as a Green Party candidate in London, Ont. in the 2015 federal election and served as justice critic in its "shad- ow" cabinet the following year. David Elmaleh, who acted for B'nai Brith, says the Superior Court ruling ref lects the will of the legislature when the statute was enacted. "We need to ensure that anyone can freely criticize on a matter of public interest when there is no malice," says Elmaleh, a partner at McCague Borlack LLP in Toronto. "It is about protecting free speech." Since the ruling was issued, B'nai Brith has referenced it in fundraising efforts on its website and in a short video posted on YouTube. "Help B'nai Brith Canada de- feat Anti-Israel Lawfare" is the headline of the post. 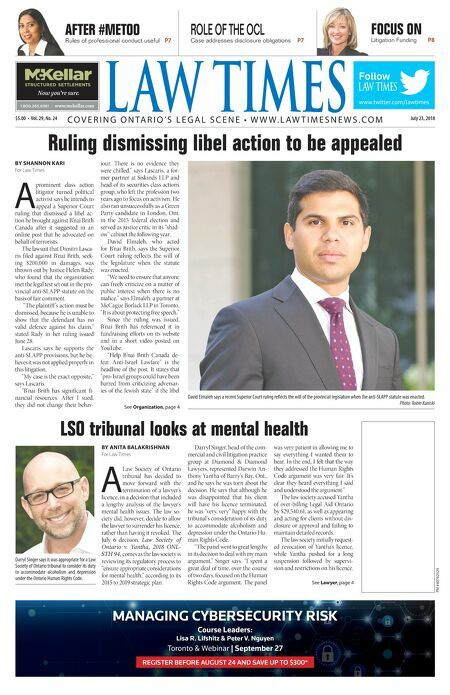 It states that "pro-Israel groups could have been barred from criticizing adversar- ies of the Jewish state" if the libel See Organization, page 4 LSO tribunal looks at mental health BY ANITA BALAKRISHNAN For Law Times A Law Society of Ontario tribunal has decided to move forward with the termination of a lawyer's licence, in a decision that included a lengthy analysis of the lawyer's mental health issues. The law so- ciety did, however, decide to allow the lawyer to surrender his licence, rather than having it revoked. The July 6 decision, Law Society of Ontario v. Yantha, 2018 ONL- STH 94, comes as the law society is reviewing its regulatory process to "ensure appropriate considerations for mental health," according to its 2015 to 2019 strategic plan. Darryl Singer, head of the com- mercial and civil litigation practice group at Diamond & Diamond Lawyers, represented Darwin An- thony Yantha of Barry's Bay, Ont., and he says he was torn about the decision. He says that although he was disappointed that his client will have his licence terminated, he was "very, very" happy with the tribunal's consideration of its duty to accommodate alcoholism and depression under the Ontario Hu- man Rights Code. "The panel went to great lengths in its decision to deal with my main argument," Singer says. "I spent a great deal of time, over the course of two days, focused on the Human Rights Code argument. The panel was very patient in allowing me to say everything I wanted them to hear. In the end, I felt that the way they addressed the Human Rights Code argument was very fair. It's clear they heard everything I said and understood the argument." The law society accused Yantha of over-billing Legal Aid Ontario by $29,540.61, as well as appearing and acting for clients without dis- closure or approval and failing to maintain detailed records. The law society initially request- ed revocation of Yantha's licence, while Yantha pushed for a long suspension followed by supervi- sion and restrictions on his licence. See Lawyer, page 4 www.twitter.com/lawtimes Follow & $#&!&jmmm$cYa[bbWh$Yec ntitled-4 1 12-03-20 10:44 AM MANAGING CYBERSECURITY RISK Course Leaders: Lisa R. Lifshitz & Peter V. Nguyen Toronto & Webinar | September 27 REGISTER BEFORE AUGUST 24 AND SAVE UP TO $300* Untitled-2 1 2018-07-17 2:57 PM Darryl Singer says it was appropriate for a Law Society of Ontario tribunal to consider its duty to accommodate alcoholism and depression under the Ontario Human Rights Code.